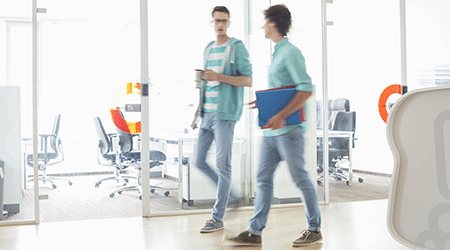 With rapidly growing demands on Storage Area Networks (SAN), IT departments require the best performance, capacity and overall value from their storage investment. 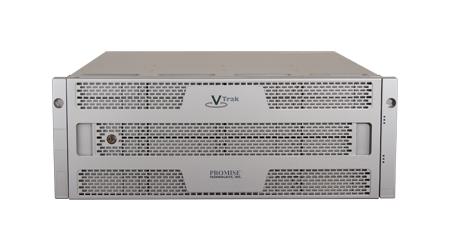 The PROMISE VTrak Ex30f delivers on all fronts, with unparalleled next generation storage processing power. 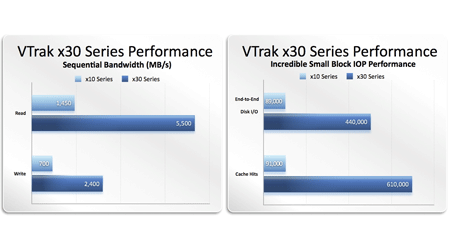 Using high-speed 8 Gb/s host connectivity coupled with massive internal bandwidth, the VTrak Ex30 features the latest 6 Gb/s SAS/SATA drive technology that sets a new performance standard. 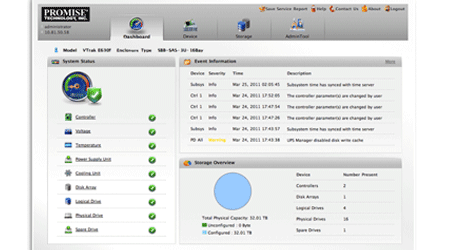 The VTrak Ex30 also features an easy to use web interface to simplify storage setup and management. 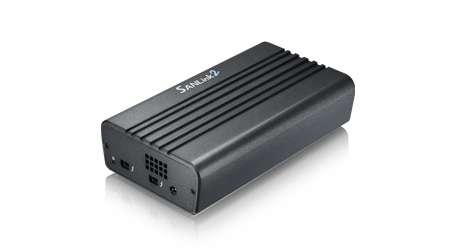 Dual active-active controller modules are internally connected using high performance PCIe Gen2 and delivered in an industry standard Storage Bridge Bay (SBB) 2.0 compliant package. 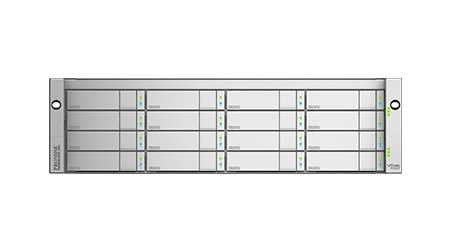 Hosts connect to VTrak Ex30 through quad 8 Gb/s FC ports per controller, giving users a staggering 6.4 GB/s of bandwidth to their stored data. 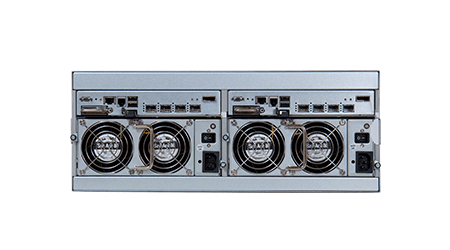 Built upon Intel’s next generation storage platform, the Intel Xeon processor C5500/C3500 series with the Intel 3420 chipset, the Promise VTrak x30 Series is equipped with the horsepower to handle the rigorous demands of today’s enterprise environments. Dual power supplies/cooling units come standard, to ensure exceptional uptime and reliability. VTrak products utilize environmentally-friendly production methods and materials and are designed with high-efficiency in mind. Powered by 80Plus Bronze certified power supplies that offer up to 85% power efficiency, all VTrak x30 Series products improve TCO by conserving power, reducing heat output and improving cooling costs. Additionally, the Promise GreenRAID initiative includes advanced power management support for hard disk drives, providing up to 65% energy savings. Dual active-active 8 Gb/s Fibre Channel controller modules with cache mirroring over a high-speed PCIe Gen 2 link allow for redundant data paths to ensure data availability, while dual power supply units, battery backed cache, and intelligent cache management strategies are in place to minimize downtime and protect user data. 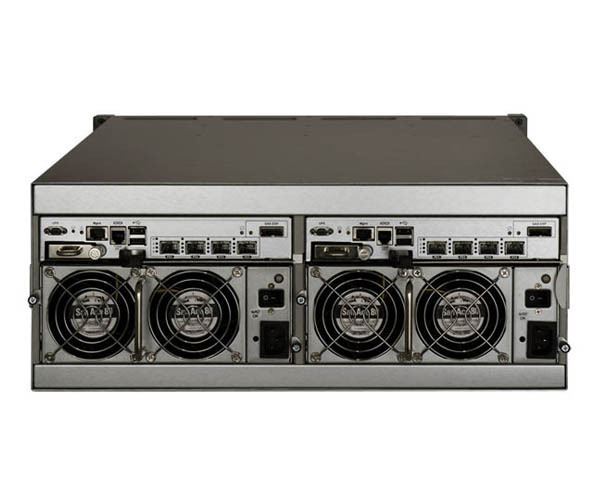 Hardened controller fail-over strategies, autonomous healing technologies like predictive data migration, along with robust RAID 5 and RAID 6 algorithms work together to improve system fault tolerance capabilities and assist in keeping continuous data access. A faster processor, faster FC ports, and more memory is just the beginning. 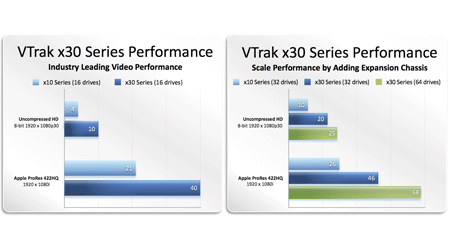 Enhanced cached mirroring design, auto-regeneration of data to mitigate frame drops and optimized disk access all add up to blazing performance for broadcast and editing environments.The VTrak x30 Series optimizes performance to enable media professionals to increase productivity by up to 2.5 times over the previous generation VTrak, delivering best-in-class performance. 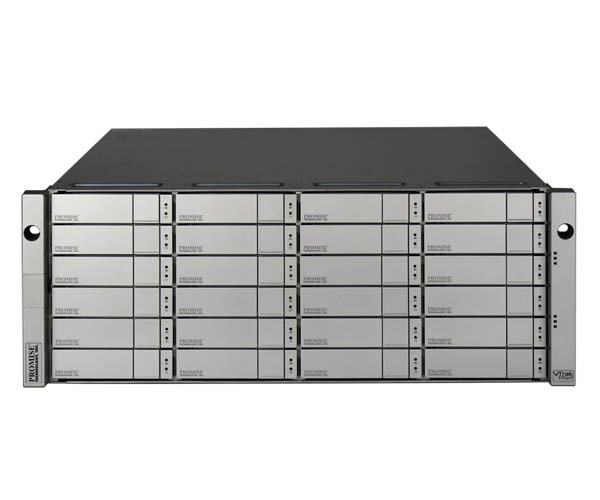 Designed with simplicity in mind, the all-new WebPAM PROe takes VTrak storage management to a new level. It includes: automatic configurations tuned for common applications, non-disruptive software updates, power savings scheduler, performance and power monitoring statistics, drag-and-drop LUN mapping/masking and much more. Everything you need is built in, just log in through Safari on your Mac or iPad.VTrak x30 Series enables enterprise-class management capabilities by supporting the latest in SNMP and CIM standards to work with popular enterprise monitoring software packages. In addition, for those users needing to propagate similar configurations over multiple RAID subsystems, WebPAM PROe has functionality to import configurations with just a few clicks of the mouse.